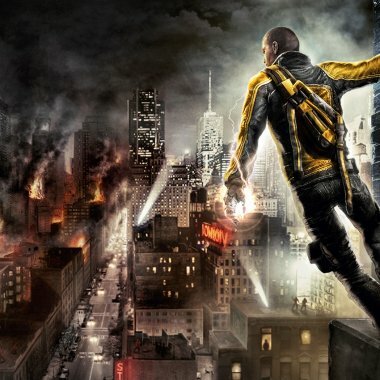 A second run through DICE’s first-person parkour game confirms its status as a last-gen gem. If you’ve played Mirror’s Edge, you’ll know what it’s all about. You run. That’s what you do. Run and jump. Run and slide. You run in other games too. But Mirror’s Edge is the first to actually make it feel like running. Each level begins in the same way: there’s you, a rooftop and a skyline to clamber across. The background hum of traffic, far below, surrounds you until the moment when you push forward on the left stick. That’s when it starts: the squeak of rubber soles hitting concrete, the rustle of fabric, the rush of wind, the heavy breathing. The blood’s pumping now, and the sound of momentum is deafening. Mirror’s Edge excels not only in placing you within a world, but within the body of its lead character – Faith. Her breath feels like yours, and you hold it as dearly as you do your own when you leap from building to building, moving forwards at speed towards your goal. Faith’s a runner. A courier. A bagman for a resistance movement that’s been forced to the margins of society by an authoritarian government. Neither group is sketched out in much detail in the game, purposefully. Faith’s a runner, you see. She runs. That’s what she does. She doesn’t take sides so much as work around them. It’s only when her sister is framed for a murder that she didn’t commit that Faith is forced to go directly against the forces of power in the city. This brings on unwanted attention – namely police officers, or ‘blues’ in the game’s parlance. Blues bring guns and bullets and tension – and it’s exhilarating to slip past them, ducking and weaving and dodging the paths of their projectiles. It’s to the game’s credit that, although it gives you the option to take on foes with melee combat or gunplay, it doesn’t force you to. Developer DICE set out to make a first-person parkour game, and it has. The guns and ammo might be a concession to the mainstream; an attempt to win over those gamers who would perhaps be put off by a title entirely free of violent interaction. But, when all’s said and done, this doesn’t matter to the rest of us. What matters is the world, and the feeling you get when you’re in it. The Mirror’s Edge city is one of the most visually arresting in gaming. The vivid blue of the skybox contrasts sharply with the gleaming, sun-bleached white of the cityscape and the splashes of colour that adorn the buildings – bold reds, oranges and yellows. Sterility has never been rendered so beautifully. It’s rare that you get time to take it all in, though. The game insists on pushing you forward, wanting you to keep up the momentum and feel the thrill of the physicality it so wonderfully replicates. However, it’s in these moments, when you’re under pressure and you make a mistake, that the game loses some of its magic. Arguably, it’s not the game’s fault, it’s the player’s. You didn’t learn the systems properly, or read the cues. But it’s deflating when you fail to land a roll properly and your pace grinds to halt, or when you mistime a jump and have to pull yourself up, slowly, from the ledge you’re now hanging off. It’s in these moments that you feel like a bumbling idiot, rather than the lithe athlete that Faith is depicted as in cutscenes. Yet, some would argue (myself included) that the real Mirror’s Edge doesn’t start until the game is finished. It’s the time trials and speed-runs that offer the purest experience. Watching replays of leaderboard champions is a revelation. New routes through levels suddenly open up thanks to move combos you never thought to try before. In levels where, the first time through, you’d have taken the stairs, in the time trails you find yourself wall-running and clambering from top to bottom, never setting foot on a horizontal surface. In these modes, parkour skills are honed and proved through leaderboard rivalries, as friends strive to shave fractions of seconds off level completion times. Back at the time of release, this aspect made the game for me – extending its longevity well beyond the on-paper story completion time of six-to-eight hours. Replayed now, several years on, leaderboard activity is hard to come by – removing a large part of the motivation to improve, and to push the game’s control system to it’s limits. This doesn’t make Mirror’s Edge any less of a wonderful, unique experience. It might not have had the impact on the charts that the publisher, EA, hoped it would. But its influence can be seen today in the first-person acrobatics of Titanfall, or in the rooftop-running of the most recent Thief game, as well as the upcoming Dying Light. Meanwhile, DICE is at work on a prequel for the new generation of consoles. Little has been said about it beyond the announcement that it will serve to tell an origin story. As far as I’m concerned, though, it doesn’t have to tell anything – just as long as it recaptures the intense exhilaration of darting up and around tower blocks; of pounding trainers into concrete; and the breathtaking rush of blood to the head that comes with each heart-pounding leap of Faith. Issue 51 of the Cane and Rinse podcast is all about Mirror’s Edge.